Explore our oceans with a planned Group visit to the National Marine Aquarium. You’ll find out more about our sharks, understand our important conservation work and do your bit to help our Ocean. There are special group rates on entry and refreshments available for all planned group visits too. Why book a group ticket? We welcome groups of 10 or more people (no upper limit) and they’re a great way to save money on large parties (e.g. coach tours, travel trade, commmunity groups etc). Perfect for day visits, city stopovers and short breaks, the National Marine Aquarium is the ideal destination for a special day out. Visits can be tailored to suit all ages and interests and can occupy a group from one hour to a full day. If you’d like to make the day extra special, you can book one of our expert guides for special hosted talk. We offer free entry for group organisers, tour escorts and blue badge guides. Free entry and catering vouchers for drivers too. Group tickets for the packages must be booked via [email protected] or call: 01752 275214. All group packages need to be booked a minimum of two weeks prior to the event and are subject to availability. These rates are for preplanned group visits such as coach parties, travel trade etc. Why not add one of our fantastic Group talks to your day at the NMA. 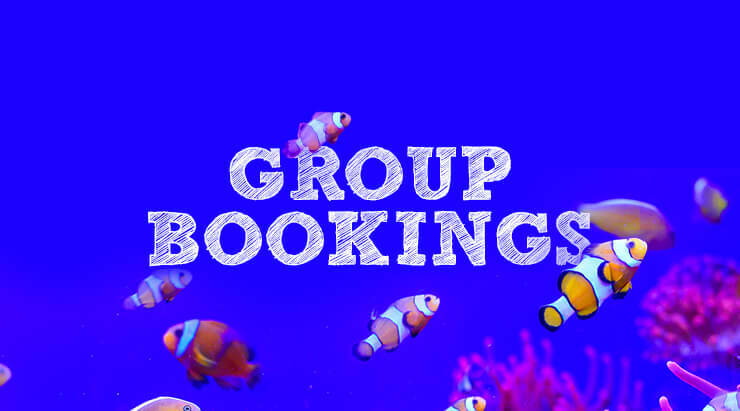 With a range of different topics and themes these will start your group visit the National Marine Aquarium in the best way. Discover how the Atlantic Ocean has shaped our lives in the last 400 years, and the impact we’ve had on it. Follow some of the amazing journeys across its surface such as the Mayflower Journey and Darwin’s voyage on the Beagle. This interactive talk will inspire your inner explorer and show Plymouth’s global connection. We begin over 5000 years ago with the world’s first aquaculture in Ancient Mesopotamia to discover how Aquarium’s came to be. Humans have always been fascinated by the ocean and deeply connected to it, together we’ll discover how that fascination has grown into the stunning Aquariums of the modern age. This is a great chance to learn more about the NMA’s position among the great aquariums of the world and see how we came to be. Get an insight into the conservation work across the world that your visit supports! From Galapagos Sharks to Devon’s Seagrass via Icelandic Seals – the NMA is the largest public aquarium in the UK and is wholly dedicated to marine conservation. Every time you visit the NMA you are driving these projects so welcome to the conservation team! Sharks are surely our most famous resident but they’re also the most misunderstood. They’ve been on our planet for over 400 million years, before dinosaurs and even trees! In that time they’ve evolved into over 500 species! From the Dwarf Lantern Shark which is no bigger than your hand; to majestic Whale Sharks which grow over 10 metres long! We’ll introduce you to some of the most charismatic and interesting of these wonderful ocean predators. All of the above talks finish with an opportunity for Questions as well as an induction to the Aquarium building. Our friendly host team will make sure you know where you’re going and don’t miss out on any special events or talks throughout the day. As well as the Nation’s Aquarium, just across the harbour is the Plymouth ‘s Historic Barbican. You can visit the famous Mayflower steps, take a tour of the world famous Plymouth Gin Distillery or head out to explore Plymouth Sound on a Boat Trip! You can really make a day of your trip to Plymouth and the National Marine Aquarium. Serving local produce with great providence plus values, we believe you are what you eat and we like to practice what we preach. From hot drinks to homemade lunches and an array of naughty treats we have you covered. To make your group day out even more special we also offer different discounts on pre-ordered catering. A 25% discount on pre-ordered catering vouchers when purchased for whole group on arrival (£50 minimum spend applies); available in value of £2.50 and £5.00. There’s even a 10% discount in our Aquarium shop for the group.